Hey Rob, just wondering why you don't water-jet these plates to save you time and labor. Could you get some of these items CNC'd for less money as well? I usually only fabricate parts if/when someone needs an interior, but the next time I get a batch of fi355 orders I'll definitely take it to the waterjet guys...wish I had one of those machines. Also received new headlight & dimmer switches...testing fitting on old bezel. Also just spoke with the FieroStore...they need to run 2000 unit at minimum to produce...so that is a no go...especially since people are not happy with the quality of the grey units. It doesn't have the stock screw mounts and it is a smaller switch. I am going to spray paint my switches black to see how it looks. Stock carpet with cuts made to lay it flat for use as a template for new. New flat carpeting stitched together on a sewing machine. Wedges were cut out at three corners and a separate piece attached over the wheel well. Buying a new molded carpet will save you the time & hassle. Fi355 door handle & release mechanism test fitting & adjustments. 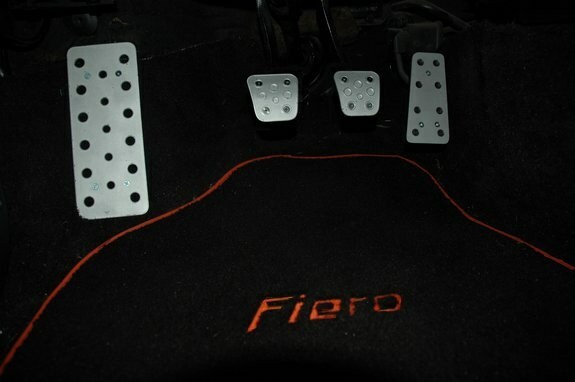 Is anyone using aftermarket aluminum gas/brake/clutch pedals? How are they attached, clamps, screws? Where can I get a set ? My rubber pedals are worn out. Wow! now I got to get a set. What color are your seats? Light gray leather Mr. Mike's with matching lower door panel. Your lower dash should match the light grey on your seats, and the Fiero grey or maybe black on the top to minimize reflection in the windshield. Trying out the Maguires plastic polish. It won't take out the deeper scratches, but it'll at least remove some 25 year old haze. Your interior is in great shape. Changing the color scheme would mean re-doing the whole interior. If you do black/light grey...then a much simpler job. G1 dash main gauge bezel with Fiero instrument cluster. The polishing helped out alot, though a few scratches remain. How do you guys like my C6 Vette gauge faces? I got tired of looking at the old boring gauges. Brasso (available at Walmart and Home Depot) is a metal polish and it will etch plastic to a mirror finish and smooth out even deep scratches. Sorry everyone, if I ask a dumb question like that...which has already been answered. I flip to this page between design calls...do a lot of skimming during the day and real reading at night. After seeing these pics I think I need some "private time by my self" .... looking Great!!!! I can't wait! Looking good! It's turning out to be a really nice piece as I assemble all of the parts together. The C6 gauge faces are prototypes. Once the layout is finalized it'll become available in your choice of colors. G1 dash defroster vents utilizing the stock hex screens from the Fiero dashboard, trimmed down and re-painted. Some great stuff going on in here! Indeed, we live in exciting times! This guy just keeps outdoing himself ! Excuse the picture I am about to post...it maybe blasphemy. Have a request...can you show a picture of the dash area where it overlaps the door skin. Best shot...would be with the driver's side door open...taking a shot of the passenger side door. Trying to see how much the dash will cover and which areas of the door skin. I am still looking at less expensive options for door skins...since the ones I want are going to be costly to produce and there are only so many days between now and the 30th in Indy. I looked at Kingdom Custom's F355 door skin (NOT ROB'S)...just because I remember that the geometry was different then yours. In my opinion his door handle seems to be more centered rather then dash forward then yours...leaving more empty forward space to cut up and re work to mold around the G1 dash. UPDATE...just chatted with Richard over at Kingdom...the door skins do not over-lay or interfere with stock dash...so there should be zero issues with using them with the G1...just need to clean up and re-work the upper right hand corner to make it look cleaner up against the G1 dash. I hope I did not offend you with posting the previous picture...haven't heard an update since I posted with question.